of the Rocking Chair Cottage in Blue Ridge, Georgia. are under the pictures of the floral giftbags. 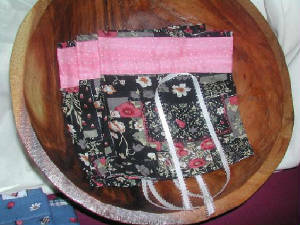 We also have some cloth gift sacks available in the following patterns. They are embellished with extra goodies to make them special! Girlies--on the Kid's Bags page.